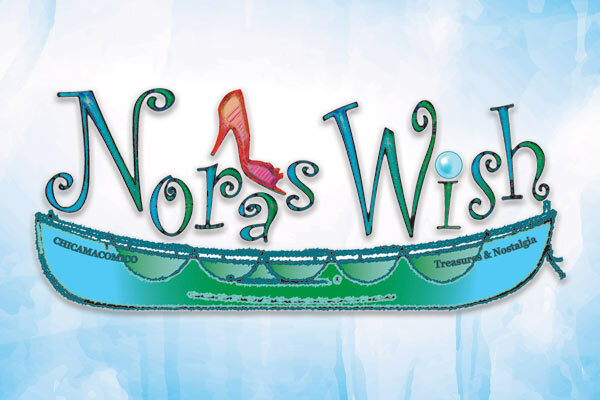 Nora's Wish Chicamacomico Treasures & Nostalgia, a historical Hatteras Island cottage in which to discover original photography prints, artwork, & creations by local crafters. Find unique gifts, handmade jewelry, antique tackle, china, glassware, and displayed history of the Outer Banks of North Carolina. Order a custom gift basket or custom driftwood picture framing. Holiday floral is a new service offering for 2018. Book a personal Sunrise/Sunset or Mystery Shipwreck history tour by a local guide. A tiny house before their modern popularity and built on ship timber, this establishment opened for business June 2012 with current hours Monday-Friday 10 AM-5 PM; and other times by appointment. Commission contracts are accepted upon jury by owner. An annual free fish fry is held on the grounds each August 15 in celebration of its Name-sake’s birthday, which is also the eve of the famed Mirlo Rescue by the Chicamacomico Lifesaving Crew August 16, 2018, led by her father, John Allen Midgett, Jr. In lieu of this year being the Centennial of that event and off-site events, a Centennial Birthday free Seafood Boil will be hosted on the Grounds for the eldest Citizen of the Hatteras Island Tri-Villages, Ms. Zenovah Hooper on June 30, 2018.